The Supplemental Nutrition Assistance Program Employment and Training initiative offers SNAP recipients in Louisiana the opportunity to gain skills, training and work experience. The program is funded by the U.S. Department of Agriculture Food and Nutrition Service, and its goal is to help participants secure regular employment and achieve economic self-sufficiency. The program is provided at no cost to SNAP recipients who participate. Under the SNAP E&T program, providers are eligible for federal reimbursement for SNAP-recipient expenses related to transportation, dependent care and supportive services, such as clothing, uniforms, equipment, emergency temporary housing assistance, books, supplies and tools. The amount and percentage of reimbursements vary based on the program and the types of expenditures. Liberty's Kitchen A volunteer program serving self-initiated youth ages 16-24 who reside in the Greater New Orleans area. Liberty's Kitchen combines hands-on food service training with classroom instruction, individual case management, job placement services and follow-up support to develop a participant’s ability to become independent, self-sufficient, and successfully employed. Calcasieu Parish Police Jury and the City of Lake Charles A volunteer program that offers services that include job search training, job retention, and work experience to self-initiated participants of all ages who reside in Allen, Beauregard, Calcasieu, Cameron, or Jefferson Davis Parish. Café Reconcile A volunteer program serving self-initiated youth ages 16-24 who reside in the Greater New Orleans area. Café Reconcile combines hands-on food service training with classroom instruction, individual case management, job placement services, and follow-up support to develop a participant’s ability to become independent, self-sufficient, and successfully employed. Covenant House A volunteer program and the only 24/7 Emergency Crisis Center for at-risk youth, serving homeless, runaway, and at-risk youth ages 16-22. 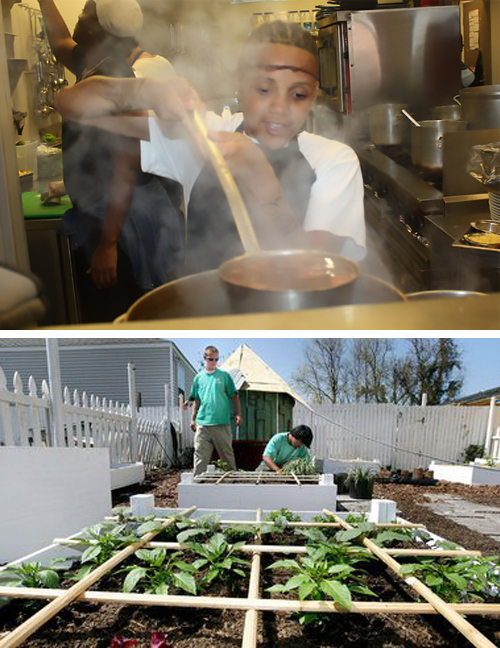 Covenant House utilizes White Dove Landscaping as the job readiness/training program for residents within Covenant House who reside in the Greater New Orleans area. White Dove Landscaping combines on-the-job training, educational curriculum in a classroom setting, hard skills that includes how to use and repair lawn equipment (e.g. zero turn riding lawn mower, chainsaw, weed eater, leaf blower), employment referrals, and follow-up support to develop a participant’s ability to become independent, self-sufficient, and successfully employed. Hope Ministries-The Way to Work A volunteer program that offers services that include education, training, and coaching to self-initiated participants of all ages who reside in East Baton Rouge Parish. Hope Ministries – The Way to Work program includes Going Beyond 40-hour workshop series, Understanding the Dynamics of Poverty, Understanding Your Workforce professional development workshops, classroom tutorials, one-on-one coaching, and follow-up support to develop a participant’s ability to become independent, self-sufficient, and successfully employed. Youth Empowerment Project (YEP) A volunteer program that offers comprehensive services to at-risk, out-of-school and court-involved youth ages 16-24 who reside in the Greater New Orleans area. Although YEP has 11 programs, SNAP E&T participants will participate in the Trafigura Work & Learn Center - YEP Works. YEP Works offers youth with opportunities to engage in work experience through YEP’s bike shop (Bike Works), thrift store (Thrift Works) and graphic design studio (Design Works). The hard and soft skill training through these programs will provide the youth with the skills and support needed to make the successful transition to become independent, self-sufficient, and successfully employed. New Opportunities Vision Achievement (NOVA) A volunteer program that offers participants who reside in Ouachita, Richland, Morehouse, Madison, East Carroll or West Carroll Parish with occupational or customized skills training, case management, work readiness/essential skills training, support services, and transition to employment services. NOVA collaborates with local educational/training institutions such as Louisiana Delta Community College, Opportunities Industrialization Center (OIC) of Ouachita, and the University of Louisiana at Monroe to provide the necessary training for demand occupations so the participant can become independent, self-sufficient, and successfully employed. Louisiana Green Corps A volunteer program that focuses on the construction industry with youth ages 18 -25 who reside in Orleans or Jefferson Parish. Their program is called Youth Construction and Conservation Corps (YCCC) and it is a 14-week job training program through which participants increase their academic skills, learn construction and conservation skills, become certified with industry credentials (such as National Center for Construction Education and Research Core Construction, Forklift Safety, OSHA 10-Hour Construction Safety, and Transportation Worker Identification Credential), and earn on-the-job training in a burgeoning and high-demand field. Louisiana Delta Community College (LDCC) A volunteer 224-hour training program that provides a Manufacturing Certification training program for individuals age 18 years or older who reside in Union, Lincoln, Jackson, Caldwell, Ouachita, Morehouse, West Carroll, Richland, Franklin, Tensas, Madison or East Carroll parish. The curriculum is focused on entry-level manufacturing skills relevant to Northeast Louisiana businesses. After successfully completing, graduates will also receive the following certifications: LED FastStart’s C4M, NCCER Core, MSSC CPT, MSSC CLA, National Safety Council Forklift, OSHA 10 General Industry, National Safety Council 1st Aid/CPF/AED, Convergence NFPA70-E (Arc Flash Electrical Safety), and MARCOM Basic Rigging Safety. United Way of Southeast Louisiana (UWSELA) Serves as a contractor for SNAP E&T services provided by subcontractors with community and faith-based organizations to provide Job Search, Job Search Training, Education, Vocational Training, and Work Experience to volunteer participants ages 18 and older who reside in Orleans, Jefferson, St. Bernard, Plaquemines, Tangipahoa, St. Tammany, or Washington parish. Cowen Institute A volunteer program in the Greater New Orleans Metropolitan area that provides pre-apprenticeship, career content knowledge, academic, soft and technical skills training, and wraparound support to youth ages 18 -24 through the Earn and Learn Career Pathways program. This is a nine-month program that provides job readiness and training initiatives which prepares youth for careers in high growth sectors in New Orleans in order to successfully gain employment with a living wage.